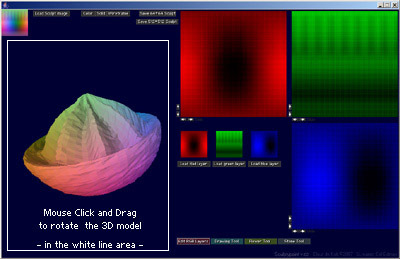 Sculptypaint Tools buttons - Switch between them, to change your current sculpt 3D object in different ways. I show the actual 64*64 pixels sculpt image, that generates the 3D model. Can crash sometimes on tga files made in photoshop, blender etc! A processing bug. And certain TGA files will render the 3D model inside out. An undo-buffer, currently 16 steps back/forward. still needs testing though. Saves the current Sculpt image; as 64*64 pixel .png in the sculptypaint folder. For linux users, it gets saved in users home-directory. Note: When you upload a sculpt-image in Second life, lossless bug can hurt or deform your sculpted 3D object, so when uploading it in Secondlife, better use the 128*128 image lossless. Or use tools like SLImageUpload that allows lossless image uploads into Second Life. Textures for sculpties are always like a 32*32 grid layout. Sphere type: 33*32 model: right side stitches to the left, top and bottom closed to 1 point. Cylinder type: 33*32 model: right side stitches to the left, top and bottom open. Torus type: 32*32 model: right side stitches to the left, top stitches to the bottom. If you have like a 64*64 sculptimage, SL will look like at points 0,2,4,6 for the data, only the last row no#63 on the bottom, or no#63 on right side is used when there needs to be a 33 model. The different type of models 32/33 are used, so alway a 'correct' texture layout for these models will maintain. Another option to convert a 64*64 sculpt image into a 3D .obj model is using the the Sculpt to .Obj script (Kris Kovacs ©2007) for the Gimp (an opensource 2D paint package). Save it as 64*64 PNG image, load this into the Gimp, then export it as 3D .obj file. Resizes the sculpt to smaller or bigger proportions again, some little distortion can happen due the calculation errors. This will not influence your model at all, just the way it gets drawn on the screen. - 16*16 - second life when Zooming out. - Sphere - Default when scupties were introduced. -- Top and Bottom gets stiched to 1 point. -- Left gets stiched to Right side. - Torus -- Top gets stiched to Bottom side. -- Left gets stiched to Right side. - Cylinder -- Left gets stiched to Right side. Turn on / off the red green and blue lines. Turn on / off the openGL lamp. To load another (square) Reference Image; drag and drop it onto sculptypaint; use png (with alpha) or gif.